The meet up time for the Dedham Flag Day parade was 5pm. We did not step off until..6:30, 7pm? And I got done a little after 8pm, and had to get back to my car and then hurry over to Cambridge to play with Secondary Deviations. I don't think I made it over there until almost 9:20. Jim made some gay jokes and told everyone that I was playing a "Fag Day Parade" which some people believe because it actually is Gay Pride Week. So I set the record straight (haha) but I also made mention that I support gay people. It's all good, I got no problem with gay people. 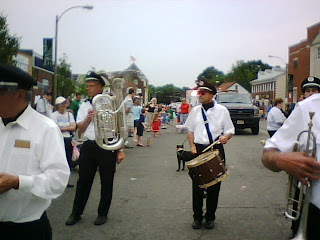 I'm just getting back from doing the Bunker Hill Day parade in Charlestown. Which was tiring since it involved going up a lot of hills. I really enjoy doing the parades though. It's nice getting cheered on by people and having them clap as you go by. Kevin Garnett is bugging out!! !